The energy sector continues to face many challenges, experiencing significant change through social, economic and legislative pressure. Though renewables undoubtedly will continue to become a popular source of primary power, the future energy sector is unlikely to be dominated by a single technology particularly given the storage challenges presented by these sources. It is likely to be characterised by diverse solutions to meet the different demands of the global and local network of energy supply. It is this current and future landscape that our range of technologies are finding and will continue to present significant benefits to OEMs, system integrators, tier and energy suppliers. We have developed technologies which offer significant opportunities for efficiency, cost and other benefits in the supply chain by applying additive processes and our agile product delivery strategy. We are engaged in development projects for a range of energy systems including, industrial gas turbines, micro gas turbines, fuel cells, nuclear, concentrated solar power, SCCO2 cycles and other novel heat and power generation systems. Through our expertise in energy system design and additive design guidelines, we have created opportunities to dramatically reduce product size, increases in cycle efficiencies and increases in product life. For recuperators, we have realised 75% reductions in core volumes for a given effectiveness. In the area of turbomachinery, we have been able to reduce the mass of radial turbines wheels by as much as 50% delivering low inertia wheels for CHP applications. In the same application, we have demonstrated that surface temperatures of radial wheel tips can be reduced by up to 100°C to allow more cost-effective materials to be used, or alternatively by processing high gamma prime content alloys such as CM247 LC to allow increases in turbine inlet temperatures by up to 200°C. 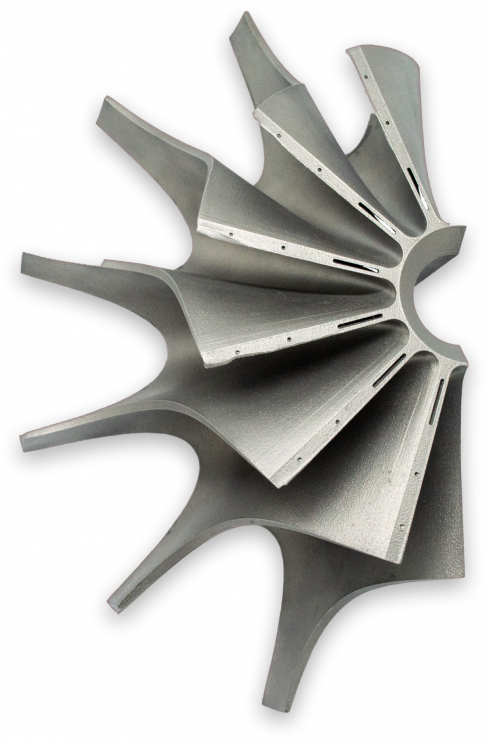 Furthermore, through the design freedoms of additive manufacturing and our understanding of thermodynamic cycles, we have identified opportunities for novel integrated systems including heat exchangers with integrated combustion elements and housings. These systems also present opportunities to achieve product lifecycle benefits in fuel saving, reduction in through life costs and purchase price. Through expertise in 1D cycle analysis component level testing, we have demonstrated a 10% increase in cycle efficiency is achievable for a 30kW micro gas turbine system resulting in significant through life cost benefits. We continue to seek new opportunities to apply our current technology portfolio and to develop novel products with partners to meet the challenges faced by the energy sector.